You must have final/completed roster to proceed. Do not submit a fake or incomplete roster, as you will not be placed on the design schedule without the required deposit/payment based on your final/valid roster. Payment options to proceed are a $500.00 non-refundable deposit or payment in full. Orders under $1000.00 must be paid in full. after final proof approval and payment in full has been received. Volume Discount pricing breaks are at 10, 25, 50, 100 and 250 units. The design and/or logos must be the same for all garments. Names can change. Orders must have a minimum of 10 jerseys, 10 hooded jerseys or 25 hoodies. Garment styles cannot be mixed to reach the price breaks. All styles must be the same. Men’s, Women’s and youth sizing of the same style can be combined to reach volume discount. Long sleeve and short sleeve are different styles and cannot be combined to reach volume discount price breaks. Pricing shown above represents base pricing. There is a $2.00 up-charge per size over XL (+$2.00 for 2XL, +$4.00 for 3XL, etc.) and a $4.00 up-charge for tall sizes. To see detailed pricing information go to the Pricing Info Page. There are no art charges or shipping charges (continental USA) for orders of 10+ jerseys and 25+ hoodies that meet the team discount pricing guidelines listed above. All jersey styles are available in men’s, women’s and youth sizes. We oﬀer youth sizing, sizing up to 6X for men and 3X in women’s cut. Tall sizing is available and adds 2” to the waist length. Men’s and Youth jerseys are a loose athletic ﬁt. Women's fit is tapered cut through the chest and waist that is a close to body fit. For specific jersey style measurements go to the Our Products Page on our website and review the sizing chart for each jersey style. Pro Style Collar with Quarter Zip, Long and Short Sleeve (short stand‐up preacher collar). Polo Collar with Quarter Zip, Long and Short Sleeve. Polo Collar with Buttons, Long and Short Sleeve. You must have an account created to place a team order. 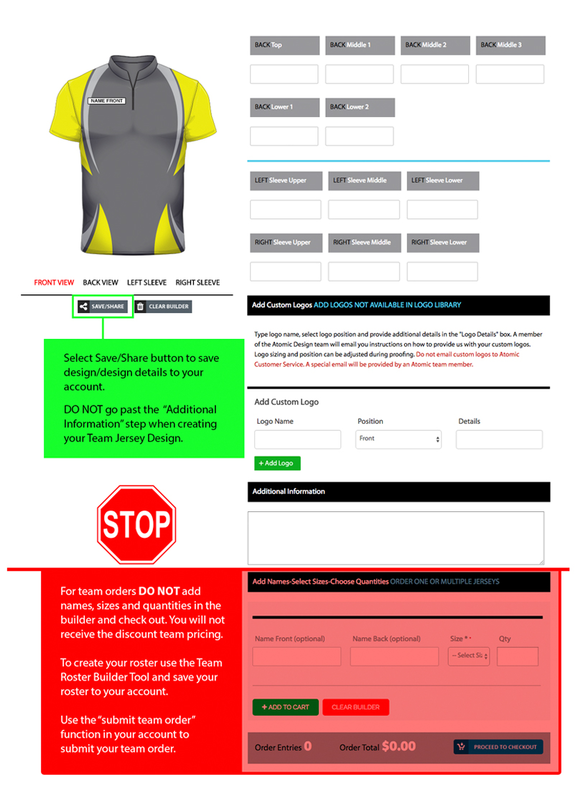 Place your team order - the form to submit a team order will be in your account. NOTE - PLACING A TEAM ORDER WILL NOT RENDER A FREE DESIGN WITHOUT THE REQUIRED DEPOSIT/PAYMENT. If you know what you want for a jersey design (colors, logos, etc.) and have your creative assets and design direction ready to go our designer can take this information and translate it into a jersey proof for your review. The best art format to provide to us is Adobe Illustrator (AI) or Adobe Photoshop. If you do not have those formats we can also do our best to work with PDF's or .JPG's and in some cases GIF's will work. Our Jersey Gallery is a great resource to find a design perfect for your team. Each image has a reference number below it. We can use the chosen image as inspiration to create a unique design with your team colors and logos. If you can provide us with a little information, our talented design team will do the rest. Do you have a team logo? Do you have team colors? We can work with as little or as much information as you have to create a unique design for your team. NOTE: When placing a team order, the jersey builder is only used to create and save your design. DO NOT add team members or check out in the builder. You will not receive team discount pricing. Adding logos in our Custom Jersey Builder is easy. Logos selected from the Logo Library will appear on the jersey design. Any logos you do not find in the Logo Library can be added using the Custom Logo feature. The Custom Logo feature allows you to create a list of additional logos, select placement, and provide special notes for each custom logo. This is a good place to add your team logos or local sponsor logos. Additional notes (optional) - share any special design requests with the design team. Save your design to your account - the "Save/Share" button is under the jersey image on the builder. If you are placing a team re-order or a new order but want to use a jersey design or artwork from a previous file you will need to provide the previous job number or the name of the individual or team the order was billed too. (Payment options to proceed are a $500.00 non-refundable deposit or payment in full. Orders under $1000.00 must be paid in full). You must have an account and be logged into your account to use the Team Roster Builder. Terms and conditions of payment and options for fill-in orders. Discount pricing is based on at least 10 jerseys or 25 hoodies of the same style (all must have the same design/logos). Men’s, women’s and youth sizing of the same style can be combined to reach the discount level. Short sleeve and long sleeve are different jersey styles. A roster with this name already exist in your account. SAVING WITH THE SAME NAME WILL REPLACE IT. Formal estimates will be emailed to you immediately. If you do not receive your estimate within 10 minutes, please check your spam folder. *Pricing provided in formal estimate is valid for 30 days and subject to change without notice. 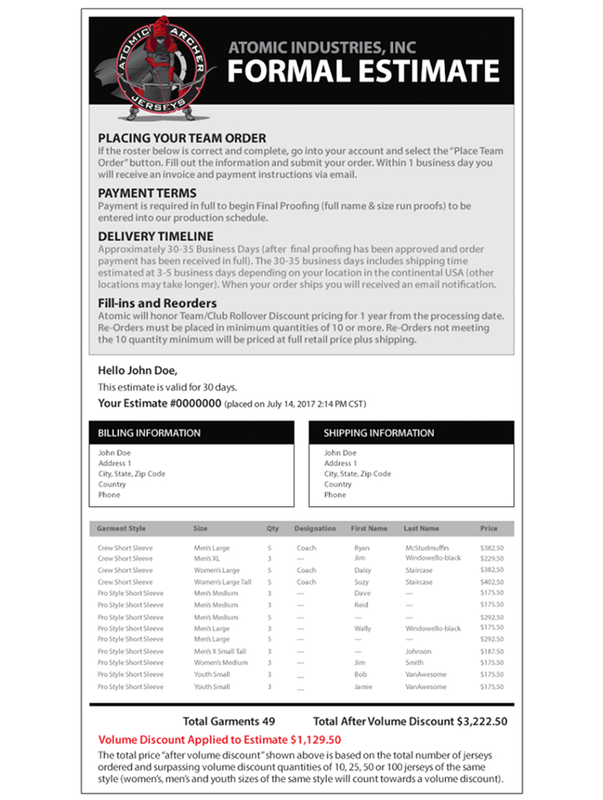 The “Go To Team Order Form” button will take you to the team order form in your account. When you complete the form you will be emailed an invoice based on the roster you submitted with payment instructions. Selected an option to get your jersey designed or have already started working with the Atomic Creative Team on your design.